The quickest answer to the question, "Why study jazz dance?" is that it is joyful. Jazz dance grew out of the social dance forms that young people had used over many decades. It is what people do when they are celebrating, relaxing, and enjoying themselves. Jazz dance class uses both parallel foot positions and turned-out foot positions. In parallel foot positions, the feet may be side by side, apart at the distance of the center of the hip sockets, or in a wide position. 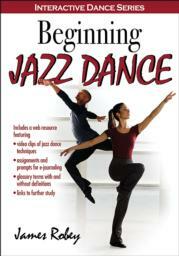 Traditional jazz steps derive from historical jazz dance styles. These steps include weight shifts and elevations combined with characteristic body positions and arm gestures. Beginning Jazz Dance is a part of Human Kinetics’ Interactive Dance Series. The series includes resources for ballet, modern, tap, jazz, and musical theatre dance that support introductory dance technique courses taught through dance, physical education, and fine arts departments. Each student-friendly text includes a web resource offering video clips of dance instruction, assignments, and activities. The Interactive Dance Series offers students a guide to learning, performing, and viewing dance. introduces students to the history, artists, significant works, styles, and aesthetics of the genre so they understand dance as a performing art. In addition, Beginning Jazz Dance comes with a web resource that includes 55 photos and 125 video clips of basic jazz dance technique. Students can access these photos and videos at any time for their study or practice, and instructors and students alike will benefit from the wealth of resources on the website, including assignments, worksheets, glossary terms with and without definitions, interactive chapter quizzes, and web links to help students develop their basic knowledge and skills. Beginning Jazz Dance provides students with the context, background information, and basic instruction they need in order to understand the genre and appreciate jazz dance as a performing art. This text, with its companion web resource, is ideal for dance majors, dance minors, and general education students enrolled in beginning jazz dance technique courses. It is also suitable for students in performing arts and magnet schools and high school dance programs. Text for undergraduate or upper-level high school courses. James Robey, MFA, is assistant professor of dance and department chair at Webster University in St. Louis, Missouri, where he received the Messing Faculty Award in 2015. He was director of the prestigious Ridgefield Conservatory of Dance for 10 years, during which he also created the Robey Jazz Dance Technique and Syllabus. He has taught as faculty or adjunct faculty at numerous universities, schools for the performing arts, and dance studios. Robey was artistic director and company artist for James Robey Dance for 14 years. He has danced for many companies, beginning his dance career in 1990. He has also acted as choreographer for numerous ballets and dance ensembles over the years, and he has presented at conferences and written numerous articles on jazz dance and related topics. Robey is on the board of directors of the American College Dance Association and is a member of the National Dance Education Organization, National Association of Schools of Dance, and Phi Kappa Phi Honor Society. The web resource features 48 photos and 117 video clips that provide students with a personal tutor for practicing or reviewing basic jazz dance techniques learned in class. Also included are assignments, work sheets, glossary terms with and without definitions, interactive chapter quizzes, and web links to help students develop basic knowledge and skills. All ancillary materials for this text are FREE to course adopters and available online at http://www.humankinetics.com/BeginningJazzDance1e.